I do not take much care of this blog the last few years. Not much input or something to share. It is not that I am not journaling; I am. Just to myself. Every day. I keep a daily log of what happened. This started when one day I realized that I could not remember what I had done the previous week. Work related mostly, but indeed I could not. Had my manager asked me “Why did we pay you for this week?” I could not tell him. So I started keeping one or two sentences per day, at the end of the day. What I thought was the most important thing to remember a month from now. And then other things happened: outages, maybe something that got me angry, something I learned, something I enjoyed, something I am planning. They all go in there. Sometimes I neglect scribbling even a sentence a day. Maybe for four days in a row. But then when I sit down I make an effort to remember. At first something comes into mind and I put it down. Then, usually when I am noting something of another day, something pops up (“Wait, was this yesterday, or the day before?”) and the timeline of events falls into order. These days I have my file open while I am doing stuff and sometimes I keep my notes while things happen. Like when I had Zookeepers that refused to bind to IPv4 addresses. Well, export KAFKA_OPTS="-Djava.net.preferIPv4Stack=True" goes into the journal and for future reference. So there, I write to myself daily and somehow this is helping me a lot. In recalling back things, keeping track of my day, stuff like that. But I guess there’s some light version of the spoon theory for blogging, and since I blog to myself every day, I’ve not much to share. Whatever few glimpses are there, usually go to Facebook, or twitter. The price of bringing all the theatre and component service plans into harmony with each other, into one plan, was the total elimination of any flexibility in carrying it out. Yes no flexibility at all in a military machine where the no plan survives first contact with the enemy is dated around the same time (1963). In this case the inflexibility was due to the lack of staff and computer time available to complete alternatives. This is similar to Gosplan’s problems: they had so many inputs to their models, that their planning for the current year was completing around October of said year. Ambition in planning, lack of resources and definite inflexibility in taking another route because of already committed resources. Wow project management does not change at all, in any field and in any bloc. I am 20% into the book and I am scared. It seems to me that we have survived out of pure luck. A friend asked me the other day whether a certain “search and replace” operation over a credit card number could be done with sed: Given a number like 5105 1051 0510 5100, replace the first three components with something and leave the last one intact. So my friend asked, why not use \d instead of [[:digit:]] (or even [0-9])? There. I guess that is why I still do not make much use of the -r flag and prefer to escape parentheses when doing matches in sed. I knew of Hintjens’s work (Xitami, ZeroMQ, etc) but not much more of him. The book popped up in a Slack I am a member of while discussing Torvalds’s decision to take a step back and work on himself. Hintjens writes a technical memoir. At least that is the first part of the book. And because he writes stuff about the era of computing I grew up into, I like it. He reminded me of technologies, tricks and methods I had long forgotten. I even learned new old stuff that I had never come across. And the there is the second part of the book. The most important and most interesting one. What can I say about it? Not much I am afraid. I can only declare my respect for his effort to document the process and his voyage towards the end. I envy his clarity, even though I cannot even begin to imagine the cost for it to be maintained during the cancer treatment process. PS: I am trying to see whether using Goodreads to write my thoughts on books I read is a thing that I like. Hello and happy SysAdmin day. 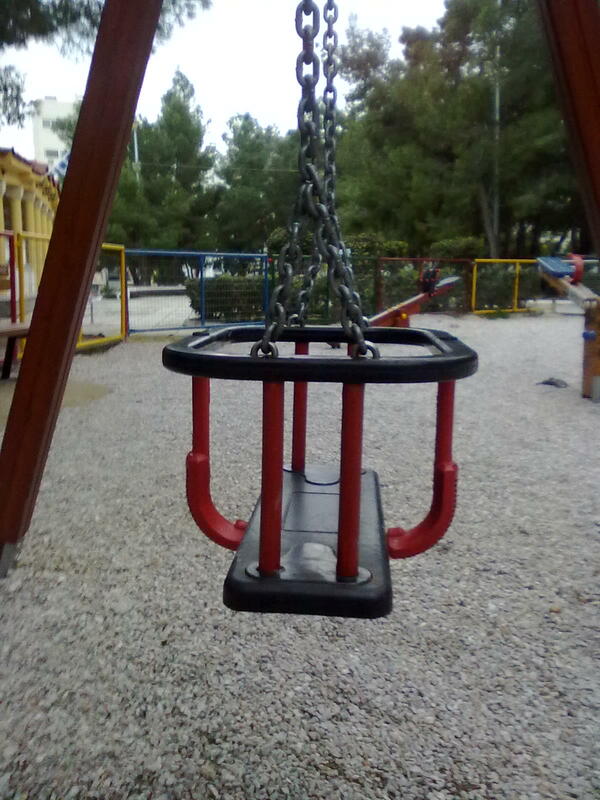 The baby swing bellow is from 2011. While at rest it looks like a safe swing, it is not. The chains latch too close to the middle and it is very easy for the seat to revolve around a second horizontal axis while swinging. You can understand how I know. It is SysAdmin day today. We make sure the chains latch properly so your software runs without extra revolutions.